Examples of the first release of the classic Revell Toryu kit H-104 are copyright dated in the instructions for 1972 and 1973. 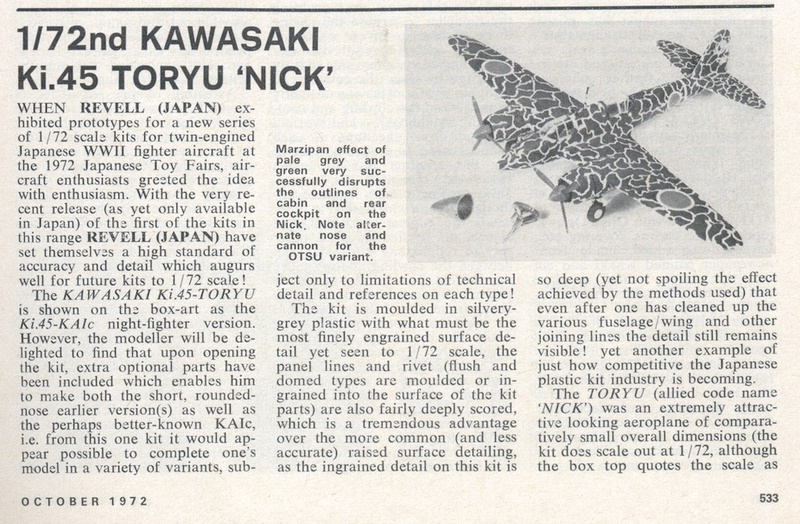 Burns* lists it as being first released by Revell Japan (marketed then by the paint manufacturer Gunze Sangyo) in 1972 and it was reviewed in the October 1972 issue of Scale Models magazine. In the UK it was marketed in a rather flimsy top-opening box with art by Kihachiro Ueda as shown above. 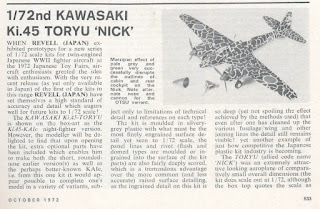 The Revell kit stood the test of time as the only game in town for a 1/72 model of the Ki-45 for over 20 years until the release of the new mould Hasegawa family of Toryu kits in 1995. Although production and retail availability ceased at some point in the early 1980s, reportedly as a result of the mould being lost at sea, the kit has been fairly easy to obtain on the second hand market and is not considered to be particularly rare. The first release Revell kit, moulded in silver plastic, represents an early production Ki-45 Kai Tei with oblique armament, incorrectly identified in the instructions as a "Ki-45 KAIc" (Hei). The modest decal sheet provided markings for just one aircraft subject, ‘25’ of 3 Hikotai, 53 Hiko Sentai as depicted on the box art, and possibly represents the aircraft flown by the Hikotai Leader, Capt. Masayoshi Fujimori. 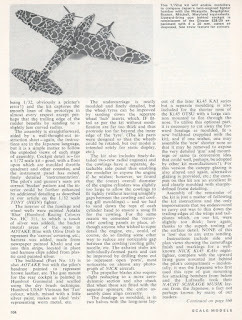 This particular aircraft had featured as a fold-out colour profile by Kikuo Hashimoto in the December 1968 issue of the Koku Fan magazine (and was reproduced again on the early blue cover FAOW No.26 of June 1972) which also included three photographs of the aircraft on the ground and in flight. 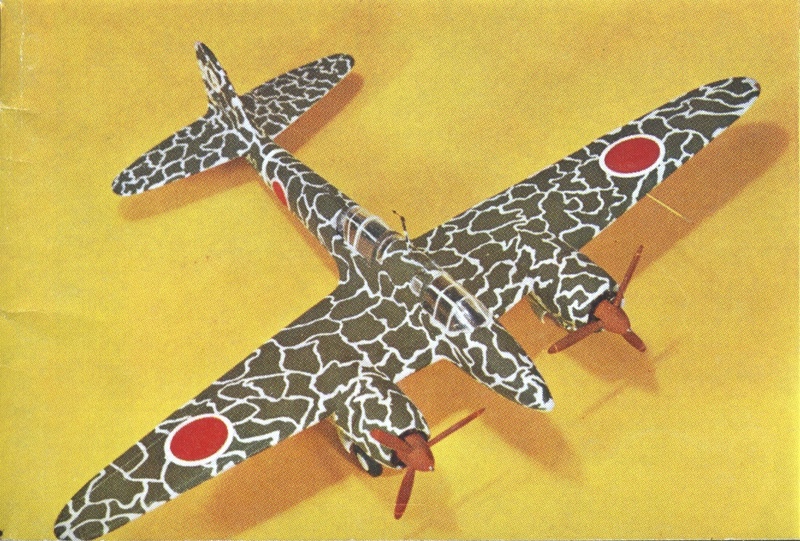 The kit contains alternative parts to build an approximation of the KAI Hei as produced by the First Army Air Arsenal, identified in the instructions as the "Army fighter version of the Toryu". The extra parts (shown above) consist of a representation of the Ho-203 machine cannon complete with solid ammunition drum, the two cannon mounting ‘Y’ frames, the bulkhead behind the weapon, a transparent fairing to replace the dorsal oblique fitting and a new nose cone. To make this version the existing nose had to be cut from the standard fuselage halves along moulded lines and the additional parts fitted to the new bulkhead. It was presumably intended that the nose cone could be left off to display the Ho-203, but the instructions are not very clear about that. To represent a late-production Hei the original nose can be left as is, the dorsal oblique armament omitted and the transparent fairing without apertures fitted. 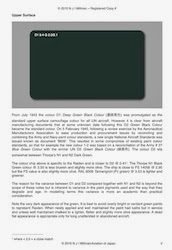 Two detail errors to catch the unwary were the painting schematic (shown below) suggesting silver as the main airframe colour (!) and the lack of a muzzle opening for the 37mm Ho-203 in the standard production nose. 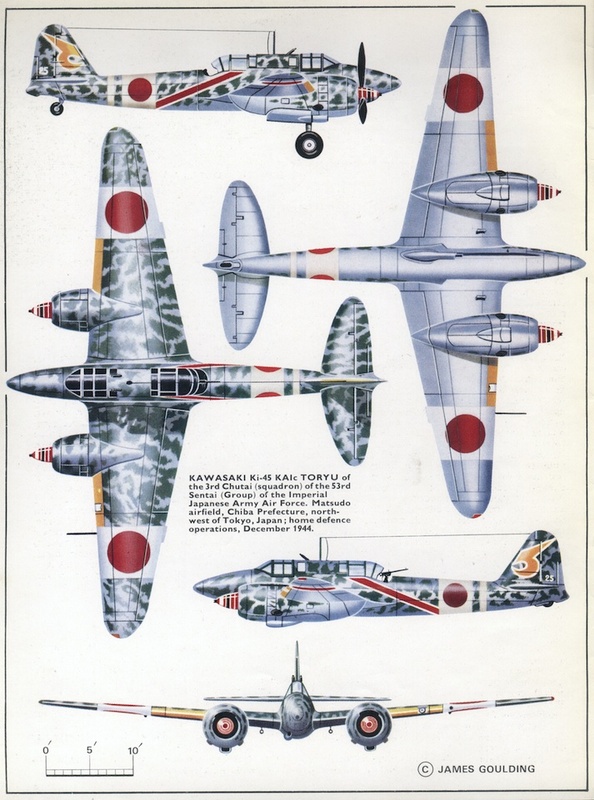 The subject of the Revell kit featured in the colour artwork shown above and created by artist Peter Endsleigh Castle (1918-2008) for an article on the type in the August 1962 issue of RAF Flying Review - 'Dragon Killer - Japan's first twin-engined fighter scored many "kills"'. This was the second time the Ki-45 had been featured in the magazine as it had earlier appeared in 'Kawasaki's Dragon Killer - Japan's Toryu long-range fighter held some surprises for the Allies' in the December 1959 issue as No.64 in the 'These Were The Enemy' series. Although the upper wing camouflage pattern in the illustration was somewhat fanciful and there was the usual contextual confusion over the designations and armament of the variants the narrative treatment of the type was typical for that magazine, being technically interested and enthused about the subject matter, objective and entirely without national bias. 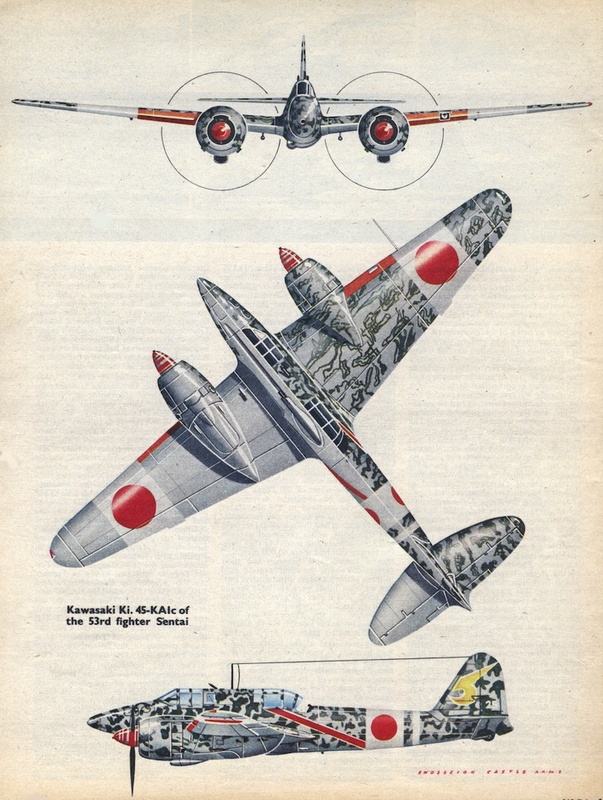 Aircraft '25' of 53 Hiko Sentai was a popular subject as it appeared again in a five-view colour illustration by artist James Goulding (1923-2010) in Profile Publications No.105 (shown below - sadly undated). From those illustrations it is easy to see how an impression of a natural metal finish could arise. 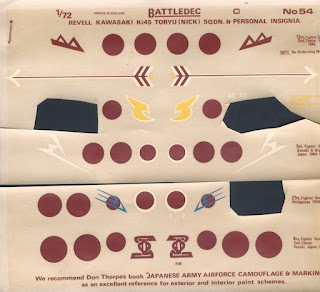 The Scale Models (UK) magazine review in 1972 referred to a decal sheet with additional markings for 45 (sic) and 5 Hiko Sentai, subjects which are included in the 1974 dated kit and 1980 Revell-Takara kits described below. It also refers to the instructions being in Japanese language only. That suggests that the kit was perhaps available in Japan from 1972 in a different format - but any additional information about kit release dates and formats is welcome! 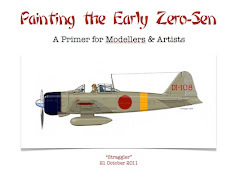 The Scale Models review is reproduced above in its entirety in (hopefully) readable format for its historic and contextual interest - but don't accept the colour, variant or unit data as gospel! In the UK 'Battledec' released a decal sheet No.54 for the Revell kit (the incomplete example shown below was found in a second hand kit) with optional unit markings referencing Donald W Thorpe's 'Japanese Army Air Force Camouflage & Markings WWII' which had been published in 1968. An original (or second?) release of the kit, an example examined copyright dated 1974, is presented in a more robust and glossy box, typical of the Revell kits marketed in Japan, with different box art by Kihachiro Ueda depicting aircraft '62' of 2 Hikotai, 53 Hiko Sentai with striking red nose flash (shown above). All examples of this release seen have the instruction sheets printed exclusively in Japanese language throughout but if anyone has an example with a different copyright date and/or instructions in English please send in scans, thanks. 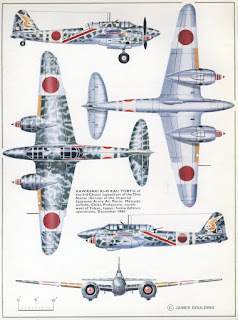 The kit itself is identical, moulded in silver plastic, but includes a more comprehensive decal sheet offering markings for three mottled aircraft, one of them a late production Tei air-to-air rammer, aircraft '40' of 53 Hiko Sentai with a large representation of a Karimata arrow painted on the fuselage side. This has frequently been described as a Kaburaya or signal arrow but in fact represents the bifurcated or twin pointed arrow used for hunting big game as well as in war so the connotations for the twin-engined Toryu striking a B-29 are evident. Karimata arrows often had a whistling or shrieking bulb attached to them behind the tip as shown on the 53rd's marking but were not the 'turnip head' signal arrows per se. The third decal option is for a First Army Air Arsenal Hei of 2 Chutai, 4 Hiko Sentai (misidentified as 45 Hiko Sentai), providing a subject for the kit's alternative parts for that variant. 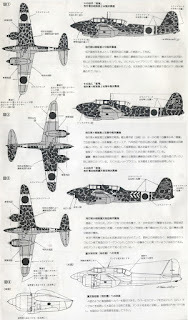 All three subjects are described as being overall light grey white colour with deep green colour blotches on the upper surfaces.The instructions show the modifications needed for the individual exhaust outlets and the faired in rear canopy of this aircraft with the drawings and markings profiles (shown above) created by Kikuo Hashimoto, well known for his plans and profile artwork in the Koku Fan magazine and early FAOW series of books by Bunrin-do. The final release of the Toryu kit that I'm aware of was marketed by Revell-Takara and is copyright dated 1980. The box art (shown above) is a lovely painting of a pair of 5 Hiko Sentai Toryu against a dramatic cloudscape with an early production Hei in the foreground. The artist is unidentified but the work is suggestive of early Shigeo Koike, especially the unusual background colouring. Examples of this kit are moulded in a very dark green plastic. 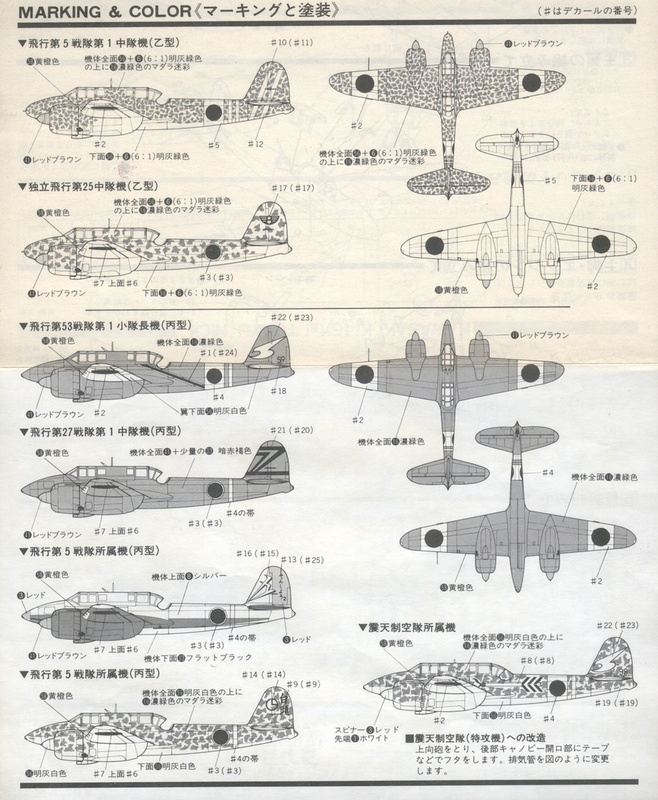 The decal sheet offers no less than seven subjects, including two early production Hei incorrectly identified as Otsu (the box art subject and a mottled aircraft attributed to 25 Dokuritsu Hiko Chutai with the 'winged eight' insignia*), four early production Tei all with oblique armament and incorrectly identified as Hei (aircraft '59' of 53 Hiko Sentai in overall dark green, an aircraft of 1 Chutai, 27 Hiko Sentai in overall dark red-brown, the well-known partially paint-stripped harlequin Toryu of 5 Hiko Sentai and a mottled 5 Hiko Sentai example from New Guinea with the individual aircraft name Mount Haku on the rudder) and lastly a late production Tei air-to-air rammer of 53 Hiko Sentai, aircraft '99' with Karimata arrow marking. 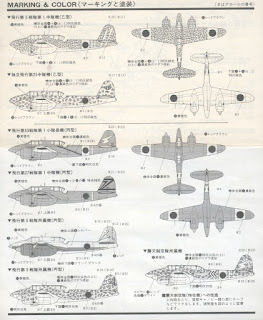 As the instruction sheet schematic below shows the colouring of the 5 Hiko Sentai partially stripped aircraft is ambiguous, with the upper surfaces described as シルバー shirubaa (silver) and the under surface as フラットブラック furattoburakku (flat black), although depicted with a partially natural metal belly. The rudder is described as レッド reddo (red) and the spinners as レッドブラウン reddoburaun (red brown). Whilst that is a colourful interpretation it is probable that all the unstripped, painted parts of this aircraft simply remained in the factory applied olive drab. 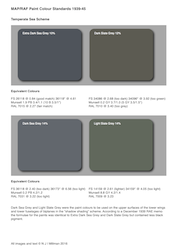 More on Toryu colours in due course. . . The Revell Toryu is a classic 1/72 kit, excellent and cutting edge when first released and still, in my opinion, worth building and enjoying for its own sake, as Carlo Reita has so ably demonstrated. 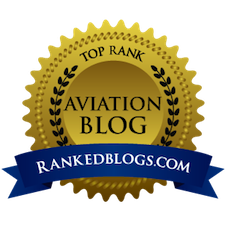 * The 'winged eight' insignia was attributed to 25 DHC by Minoru Akimoto in his series of articles on Japanese Army Air Force Unit Insignia which appeared in Koku Fan magazine. More recently, for example in the latest FAOW on the type, a different insignia for this unit has been presented, consisting of a stylised '2' and '5' combined as a white 'flash' adorned with a yellow arrow. This unit was first recorded in September 1943 as a 'composite twin-seat Fighter Squadron' attached to the 15th Air Brigade Headquarters for the air defence of Anshan in Manchuria but was subsequently activated as the 25th Independent Air Squadron in August 1944. Assertions in various publications that it was first equipped with Ki-44 fighters appear to be in error and probably the result of confusion over the 'Type 2' fighter designation. By the end of 1944 it was based at Liaoyang and at the end of the war was reported to have 25 combat serviceable Toryu on strength. 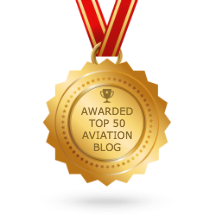 It was active during the Soviet invasion of Manchuria being involved in attacks against enemy transport columns and troop concentrations at Linhsi on 12 and 14 August and at Taonan on 15 August when it sortied nine aircraft. Image credits:- All box art and instructions © 1973 Revell; © 1974 Revell Japan; © 1980 Revell Takara; P Endsleigh Castle profile art © 1962 Royal Air Force Review Ltd; James Goulding artwork © date unknown Profile Publications Ltd; Scale Models magazine cover illustration and review article © 1972 Model & Allied Publications Ltd.
Not sure if I have ever seen Ki-45 box art that isn't at least interesting, if not exciting. One of those aircraft types that looks great no matter the color scheme or markings. Thanks Nick! 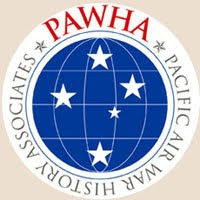 These are the kinds of articles we only get here, combining nostalgia with careful histories - of the flying units; of the hobby; and of our evolving understanding of the colors and markings involved. 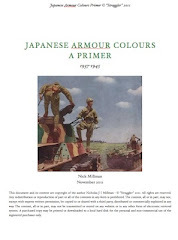 Most of us can't read Japanese, so the earlier conceptions about colors as deciphered from instruction sheets and early sources are always interesting. Thanks for all the work with this posting, Nick.